Over the last few years, we've witnessed a few different African American poetry projects concentrating on critiques of police brutality and injustice. For one, there's the project #BlackPoetsSpeakOut (Black Poets Speak Out), which began in late 2014. The project involves poets making a statement on video that "I am a black poet who will not remain silent while this nation murders black people," before reading a poem by them or another black poet. 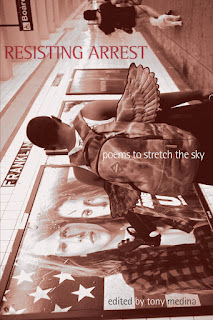 In March, Jacar Press published Resisting Arrest: Poems to Stretch the Sky (2016) edited by Tony Medina. The anthology contains poems by more than 80 poets about police killings and other violence inflicted on black people. 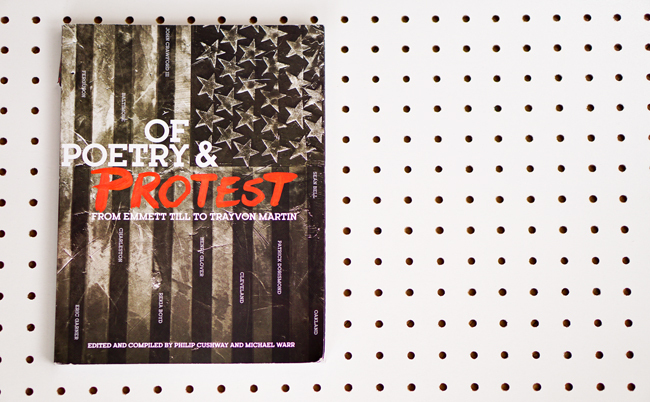 In June, W. W. Norton & Company published Of Poetry and Protest: From Emmett Till to Trayvon Martin (2016) edited by Philip Cushway and Michael Warr. The anthology contains poems by 43 poets and remarkable photographs of the contributors by Victoria Smith. Those three black poetry projects -- Black Poets Speak Out, Resisting Arrest, and Of Poetry and Protest -- exhibit different and sometimes overlapping strengths in the process of showcasing the kind of works that poets do to confront police brutality. Taken together, the projects offer a poetic complement to activist organizing broadly defined as "Black Lives Matter." At the same time, the artistic projects highlight a variety of possibilities concerning the production of black poetry in the contemporary era. Black Poets Speak Out, which includes more than 200 select contributions, constitutes the most accessible of the projects, as audiences can view the poems on YouTube or the group's Tumblr page. The project, which emerged out of a conversation between Amanda Johnston, Jericho Brown, Mahogany Browne, Jonterri Gadson, and Sherina Rodriguez-Sharpe, makes use of technology to record, broadcast, and share the poems using multiple platforms such as Facebook and Twitter. Resisting Arrest arguably has the most forceful militant thrust. Medina, who has been on the front lines of black poet activism for at least two decades now, solicited works that foregrounded concerns about the current violence against black people. Medina's project is more focused and necessarily edited than Black Poets Speak Out, and contains more pointed critiques of anti-black racism than Of Poetry and Protest. At the same time, Cushway and Warr's project is a really tremendous enterprise for multiple other reasons. For one, the relative smaller number of contributors to Of Poetry and Protest means more focused attention on the poets. Further, the book contains a mixture of poems, artwork, photographs, essays, write-ups from poets, and bibliographic information on the contents. More than any of the other projects, Of Poetry and Protest showcases the presence of the late Amiri Baraka--an artist-activist who led the way in organizing against the oppression of black folks. All three projects reveal the importance of poets as organizers. Johnston and Gadson, for instance, have been especially visible coordinating public readings and letter-writing campaigns to elected officials concerning police brutality. Medina and Warr, in their respective projects, demonstrate their capabilities pulling together a large, diverse group of poets together for common causes. Organizing large groups of artists for a distinct project requires coordination, patience, and boundless energy. Black Poets Speak Out, Resisting Arrest, and Of Poetry and Protest collectively include more than 300 contributors, which should give us some indication about the resourcefulness of the poet-organizers. What new or original directions do the projects take us? Black Poets Speak Out offers a glimpse of what's possible when poets merge artistic and advocacy interests with hashtag and online organizing. Of Poetry and Protest represents a multi-genre or mixed media black poetry anthology. Beyond the thematic focus, there's some continuity with contributors. Kelly Norman Ellis and Douglas Kearney read for Black Poets Speak Out, and her poems appear in Resisting Arrest and Of Poetry and Protest. Poems by Kwame Dawes, Rita Dove, Cornelius Eady, Patricia Spears Jones, Yusef Komunyakaa, Quraysh Ali Lansana, Haki Madhubuti, devorah major, Marilyn Nelson, Ishmael Reed, Sonia Sanchez, Quincy Troupe, Frank X. Walker, and Afaa M. Weaver appear in Resisting Arrest and Of Poetry and Protest. Tara Betts, Brian Gilmore, Mahogany L. Browne, Derrick Weston Brown, Jericho Brown, Rachel Eliza Griffiths, Douglas Kearney, Ruth Ellen Kocher, Raina J. León, Tony Medina, Kamilah Aisha Moon, Khadijah Queen, Metta Sáma, Phillip B. Williams, and L. Lamar Wilson participate in Black Poets Speak Out, and they contribute to Resisting Arrest. 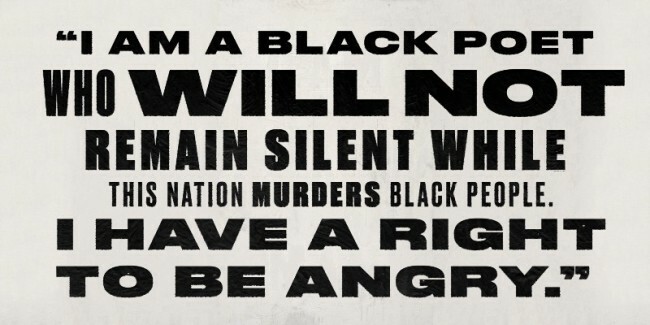 Reginald Harris and Tyehimba Jess contribute to Of Poetry and Protest and Black Poets Speak Out. All the cross-fertilization signals the inter-connectivity of black poetry projects.